Anger over corruption has sparked mass demonstrations and even toppled governments in the past few years. But a global study published Wednesday by Transparency International finds the problem remains widespread. The group's Huguette Labelle says a majority of countries have a serious corruption problem. “This translates into human suffering, with poor families being extorted to pay bribes to see doctors or get access to clean drinking water,"
TI Rankings Released with Few Surprises: The bottom line seems to be that both world's most and least corrupt countries stood pat. Latin America: Region one of worst for corruption - Despite economic strides, two-thirds of Latin America averaged in the bottom half of the 2012 Transparency International corruption rankings. Countries like Brazil, however, offer some hope. 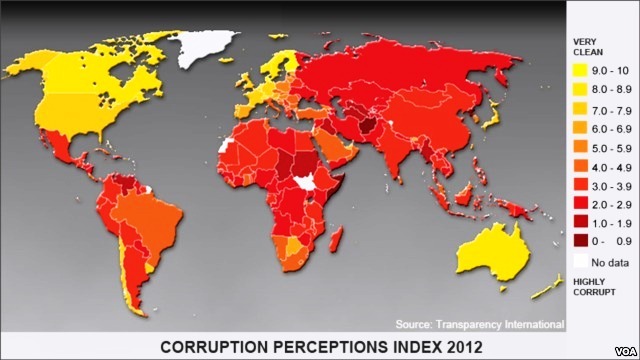 Making the world flat-out against corruption The latest ranking of perceived corruption among nations doesn't show much change. But other evidence points to a grassroots rebellion against graft in hopes of a culture of honesty. Corruption: a globalisation of risk - In TI's survey generally, the richer the country, the lower the perceived levels of corruption. But that doesn't spare companies based in the developed world from serious challenges. Is Corruption Getting Worse or are we simply becoming more open about discussing the problems that exist? Over the past two years, there is evidence of a stronger political and societal imperative to address corruption in its many facets. MANILA, Philippines - Malacañang has welcomed the latest results of the Transparency International Corruption Perception Index (CPI), which showed an improvement in the country's anti-corruption drive, although the country's ranking still remains low. The countries worst hit by the European financial crisis are also perceived as being among the most corrupt in Western Europe, and those perceptions appear to be getting increasingly negative, an international watchdog said in a report released Wednesday. Israel Travel · Shop. Bare Pass. Israel receives score of 60 in perceived level of public sector corruption Photo: Avigail Uzi. Israel ranks 39th in corruption index. Jewish state down three places from 2011, nine places from 2010 in Corruption Perceptions Index. 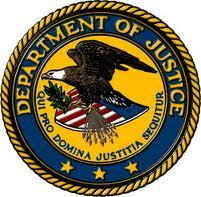 Ramped up enforcement of laws like the U.S. Foreign Corrupt Practices Act and the U.K. Bribery Act have caught the attention of boards of directors. According to a new survey, one third of board members at public companies cite corruption and bribery as the greatest fraud risk facing their company. The survey also found that directors are acutely aware of that risk when it comes to their dealings with officials of foreign governments. More than two thirds of the directors surveyed said their companies do business abroad, of those 57% said they interact with foreign officials and 32% believe risks related to bribery of those officials have increased over the past two years. US VOTER SURVEY: 64% say corporate misconduct helped bring about economic crisis...81% say government has not done enough to stop corporate wrongdoing. 18 percent of Americans polled felt that their employers' ethical values took a back seat to bottom line profits. With respect to acting on reports of misconduct, 24 percent of Americans would fear retaliation if they reported wrongdoing in the workplace and 20 percent believe that a report of wrongdoing would not be appropriately handled by their employer. Enforcement of laws prohibiting bribes to foreign officials is almost exclusively isolated to the U.S. and Western Europe, a new report found. Of the top seven countries that actively enforce foreign bribery laws, all are located in the West...The U.S. was by far the most active enforcer with 275 cases completed as of 2011, and 113 investigations underway. The rest of the top seven was rounded out (not in order) by: Germany, U.K., Italy, Switzerland, Norway and Denmark... the total number of cases that have been prosecuted since the convention was passed jumped from 564 in 2010 to 707 in 2011...more than 250 individuals and almost 100 companies were sanctioned as a result of foreign bribery-related cases by the end of 2011. So far, 66 people have gone to jail in those countries for bribing overseas officials in business deals. Click here to read the full report: "EXPORTING CORRUPTION? COUNTRY ENFORCEMENT OF THE OECD ANTI-BRIBERY CONVENTION, PROGRESS REPORT 2012"
Creating good jobs, reducing corruption in the federal government, and reducing the federal budget deficit score highest when Americans rate 12 issues as priorities for the next president to address. The survey respondents clearly identified how corruption impacts their companies: 44 percent agreed that corruption presents a “significant obstacle to doing business”—down from 48 percent who thought that way in 2008, the last time the survey was administered. Overall, 51 percent of respondents believe “they have lost business to competitors that have made illicit payments,” while 72 percent say the anticorruption laws in their country are not effective...85 percent of respondents said their company’s management “has taken steps to protect the organization from corruption risk”—up from 77 percent of respondents in 2008. The top measures that are being implemented by management, according to respondents, are: anticorruption policy (81 percent); procedures for gifts, travel, and entertainment for officials (nearly 70 percent); procedures for charitable and community donations (62.6 percent); and anticorruption training (61 percent). 30 percent of respondents feel that the SEC/SFO effectively deters, investigates and prosecutes misconduct—despite the new leadership, record enforcement actions and new reforms; 29 percent of respondents feel the same way about FINRA/FSA. One in five of the professionals surveyed weren't sure of, or had serious doubts about, how their employers would handle a report of wrongdoing. Fifteen percent of chief financial officers around the world are willing to make cash payments to win or retain business, according to a survey of executives interviewed by the accounting firm Ernst & Young LLP. The firm’s annual “global fraud survey” of 400 finance chiefs, interviewed from November to February, found a greater tolerance of bribery compared with the previous year, when 9 percent said they would make cash payments. Five percent of CFOs said they would misstate financial performance, while 3 percent said that the year before, according to the survey. Q: For each of the following, can you tell me whether you think it applies, or does not apply, to your country/industry, or whether you don’t know? The “Don’t know” and “Refused” percentages have been omitted to allow better comparison between the responses given. China results include Hong Kong. Selected country results are contrasted with global results to the left for illustrative purposes. Deloite's inaugural Bribery and Corruption Australia and New Zealand survey highlighted that exposure to bribery and corruption was on the rise and that several organisations either did not recognise the risks, or were not addressing them. Corporate Fraud Data Base of significant corporate fraud prosecutions: 124 corporate fraud investigations, resulting in 440 indicted defendants...contains information about when and where these cases were brought, the lawyers on both sides, and how the cases turned out...a historic portrait of corporate fraud prosecution in the post-Enron age. somewhere on a company’s books. hard part is concealing and ending it.